Today, I visited the Nationwide Building Society branch in Greenock today. I spent time meeting the team, touring the branch, learning about the services Nationwide offers and experiencing first-hand the latest technology that can help customers manage their finances in a way that suits them. One of the services I saw in action at the branch was Nationwide Now, the Society’s high definition video link to Nationwide financial consultants around the country, including an advisor hub in Dunfermline. The facility allows customers to complete mortgage applications and attend financial planning appointments at a time that suits them, without having to wait for an in-branch consultation – underlining Nationwide’s commitment to putting customers’ needs first. I was delighted to have the opportunity to visit Nationwide in my Inverclyde constituency today. Having access to a financial provider on the high street is very important for people in Greenock and it’s great to see how Nationwide is embracing the latest technology, but at the same time not forgetting the importance of the human touch. I look forward to working with Nationwide and the team in Greenock in the future. Full Scottish goes all cultural this week, with a focus on the creative economy, design, innovation and economic regeneration. Michelle Rodger, Richard Walker and the Full Scottish crew are off to a new venue in West Kilbride for the day. The Barony Centre is home to Craft Town Scotland, a community led initiative and registered charity. This initiative is focused on art and cultural development, community development, economic development and the built environment, breathing new life into old and/or rundown empty buildings. After the weekly newspaper review we’ll be talking to Maggie Broadley, Glasgow School of Art graduate, potter and Creative Executive for the award winning Craft Town Scotland. We hope to to learn more about Craft Town Scotland, the impact on the local community, and what other communities across Scotland could learn from the initiative. Ronnie Cowan, MP for Inverclyde was elected in 2015 with a majority of 11,063. 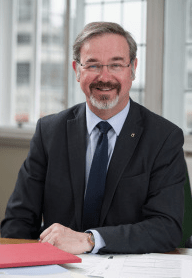 Ronnie is a member of the SNP Constitution Group at Westminster and also sits on a Select Committee – Public Administration and the Constitutional Affairs Committee (PACAC). Ronnie is originally from Greenock and after leaving school he got a job as a trainee computer operator at Playtex in Port Glasgow, and went on to build a career in IT, latterly running his own company which focused on finding IT solutions to business problems. Dagfinn Aksnes is a Norwegian product designer with a multidisciplinary creative practice in industry and academia, including design, innovation, research, entrepreneurship and engineering. He is a public speaker, course facilitator and writer with a range of published research papers and published magazine articles but is also best known for his support of entrepreneurship and innovations in product design, such as the Sinclair FM Radio Watch and the design of the first slimline UK/European mobile telephones. Music this week is from Aidan Moodie, an Orcadian singer and guitarist currently studying Traditional Music at the Royal Conservatoire of Scotland. Based in Glasgow, Aidan draws from a great range of musical influences to create a warm, honest take on folk song. He performs alongside fellow Orcadian Graham Rorie in their critically-acclaimed duo Gnoss, which has seen them win a Danny Kyle Award at Celtic Connections, and reach the semi-finals of last year’s BBC Radio 2 Young Folk Award. Earlier this week, I joined local MSP, Stuart McMillan and Minister for Public Health Aileen Campbell at the official ‘sod cutting’ to mark the start of construction of the new Adult and Older Peoples Continuing Care Hospital. The new £7.3m facility which is due to be completed by summer 2017 is being delivered in partnership between NHS Greater Glasgow and Clyde, Inverclyde Health and Social Care Partnership and HUB West Scotland. This modern mental health facility will fundamentally change the way in which older peoples care is delivered in Inverclyde. The new facility will reflect the modern approach to supporting both adults and older people in Inverclyde. Ofgem aims to approve applications in under 12 weeks where all the necessary information has been provided. Those applications still in the process after 12 weeks are likely to be complex or require further clarification from the applicant. The average time that full accreditation applications have been in the queue since applying is currently five and a half months. Ofgem is committed to continuous improvement of accreditation processes and works with applicants to get applications approved as quickly as possible. In order to accomplish this Ofgem has now doubled the level of staffing in this area and made process improvements. The answer was submitted on 12 Aug 2016 at 15:20. Next month, I will meet with the Secretary of State for Scotland, David Mundell MP, to discuss a number of pressing issues including jobs in Inverclyde and Scotland’s position with Brexit. I previously wrote to the Secretary of State to extend an invitation for him to visit Inverclyde to discuss job losses in the area and how the UK Government and its agencies are addressing the issue. The meeting has been arranged, through the Scottish Secretary’s office, for early September. We are all aware a number of highly skilled manufacturing companies (Texas Instruments, Sanmina and IBM) have announced job losses in Inverclyde. These came as a blow to the employees affected, their families and the Inverclyde area as a whole. I have continued to ask the UK Government what assistance they can and are providing for places like Inverclyde. I will be pressing the Secretary of State on all things Inverclyde and asking that both he and the UK Government consider the area for any future employment opportunities and business investment.